S/V Rutea Sails Around the World: Now this is Fun! The watermaker on Rutea makes delicious water from sea water and we have come to like it so much that we no longer fill our tanks with water from the municipality, even if it's known to be potable. Since we only hold 240 gallons, about once a week we need to leave the dock for a day to replenish our tanks. Experts say we could make water here at the dock but it looks so gross that we never would. 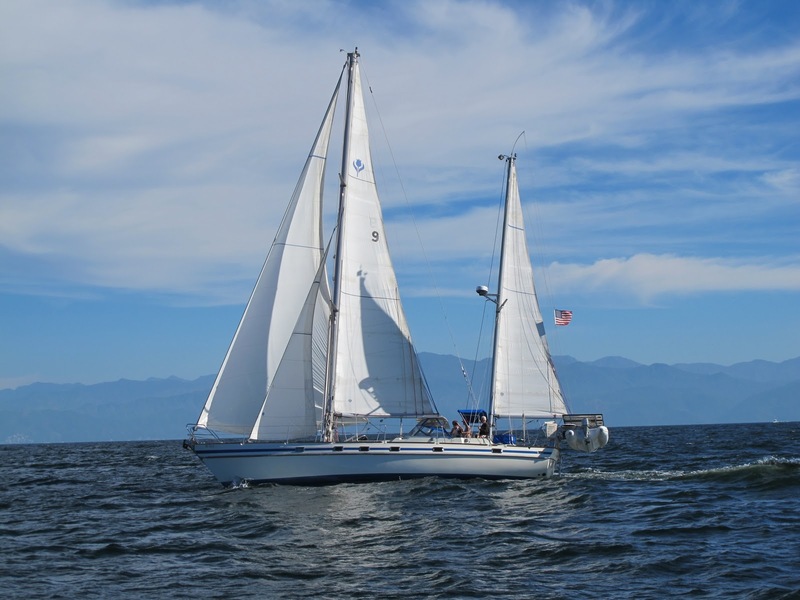 Besides, it keeps our skills sharpened to cast off the dock lines, hoist the sails and explore other parts of Banderas Bay. 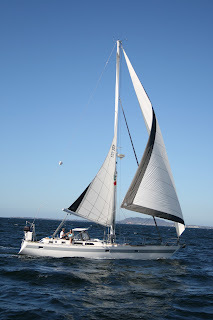 Earlier this week we motor-sailed up to Punta de Mita and dropped the anchor close to the surf line. Corie grabbed her board and jumped in for a 2-hour surfing session. Once she was back on board, we took off downwind and practiced sailing with a spinnaker pole holding out the genoa. Rutea's downwind poles are massive and we anticipate using them extensively on our trip to and through the South Pacific so we need to come up with methods to handle them safely on a pitching foredeck. Mark and Wendy also came out on Wendaway to do much the same thing. As it turns out, Banderas Bay is almost an ideal place to sail - the winds are very light in the morning and then build in the afternoon. In the late afternoon they die again. The bay has very little swell, is almost 15 miles across and has very little traffic on it. This was day sailing at it's best! One of the other things that has happened, which may or may not turn out to be a lot of fun, is that we have volunteered to be the coordinators for the 2011 Pacific Puddle Jump. The person who had originally signed up has rigging issues on their boat and can't leave La Paz. They were looking for someone in Banderas Bay to take over and me, being not very b-r-i-t-e, volunteered. At first we thought it was going to be easy but after delving into it for a little bit we're realizing that there's going to be a ton of work to do. The PPJ organization arranges for bond exemptions in French Polynesia and that hasn't been done yet and, more importantly, the t-shirts haven't been designed or ordered. Plus a list of other tasks. O, well, what the hell . . .
Mark and Wendy leave today for points south and even though they plan on returning before we leave, we'll miss having them next to us. On the other hand, we're meeting lots of other cruisers and have made many new friends, though those at home will always be fondly remembered. Please write us as we love to hear from you. All well in the neighborhood. Kidding aside, not a peep from your house. All looks great. Saw Doc, Cici and their dog today. They are following SS/Rutea too. Bumped into Scott L in the alley. We marvelled that we live where a banana tree grows in the alley. All your plants are thriving! The sailing sounds perfect. I can practically see it and feel it,(both the sailing and the smile on your face). And thanks for fondly remembering us back at home. You may be far away but you're never far out of my thoughts. Miss you and love you. A Seminar Worth Waiting For! Expect it to be different . . .